As the world turns more toward "green", people everywhere are looking now more than ever to natural solutions for everything under the sun including the sun. One of the most amazing "green" pain remedies is natural Baltic Amber. A noon-pharmaceutical solution to teething pain and a natural solution to enhancing the immune system, genuine Baltic Amber is the shining star for health and healing. What is even more interesting to note is that while the world at large is just coming to realize the balance in nature that we must achieve through better, smarter uses of our resources, Baltic Amber has been revered for centuries. 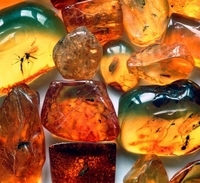 Fossilized resin that dates back over 50 million years ago, Amber was showcased in the movie Jurassic Park when the image of a mosquito was seen encased in a lovely yellow/orange rock. That was a premier debut of what scientists of admired and researched for decades as an historical event of tremendous proportion: seeing the shapes of insects, small plants, and even tiny animals immortalized in amber well before man walked the earth. Remarkable to say the least! Traditionally, natural Baltic amber is worn against the skin to reduce pain, promote fast healing, and support the bodies immune system. The natural oils in amber are then released into the bloodstream providing some amazing results: relieving teething pain in children; calming of mind and body to reduce and suppress anxiety; increasing the immune system to ward off infection, particularly respiratory illnesses; and alleviating joint and muscle pain typical of arthritis.